I got such a huge response from my blog post yesterday, thanks so much… the tweets, phone calls and comments meant a lot. Clearly I’m not alone! I’m definitely going to be signing up for Run/Walk for Life, sign ups are in 2 weeks at this new branch… and from what I understand the program is pretty slow but hey lets do this thing properly. 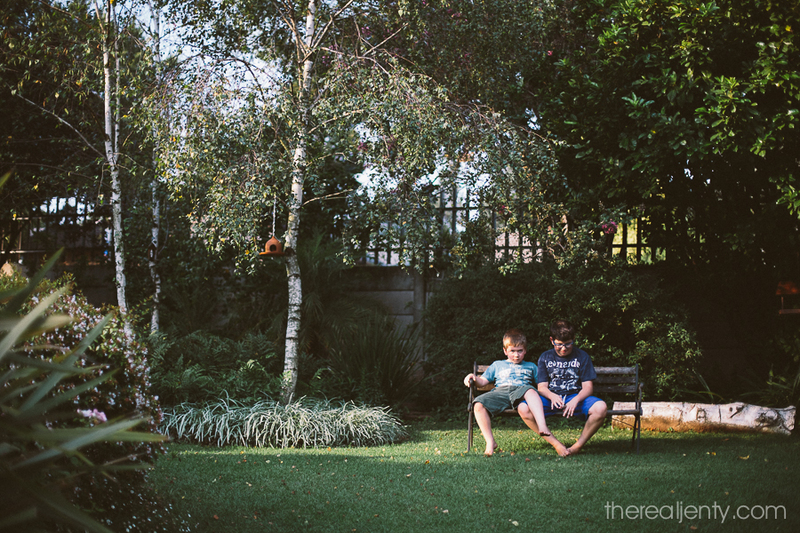 And now for the story behind this photo… it’s not often that these two boys have a quiet moment where they’re sitting so close together anymore without fighting about something. They had just finished playing a game in the garden, while they were waiting for me to finish having tea with my parents this afternoon. I would love to know what they were discussing so “decently”. It wasn’t only the quiet moment that struck me when I saw them and went running for my camera. It was Connor’s leg too. He’s such a cuddly boy. He loves cuddling and hugging, and if he’s chatting to one of us, he has to sit very close and touch us in some way. Today his leg was over Bradley’s leg. I’m hoping that doesn’t change for a while. I’m hoping that he continues being as loveable as he is, and that Bradley also allows it sometimes for a little longer.